Destination Wedding Venues Handpicked from Our Real Weddings! 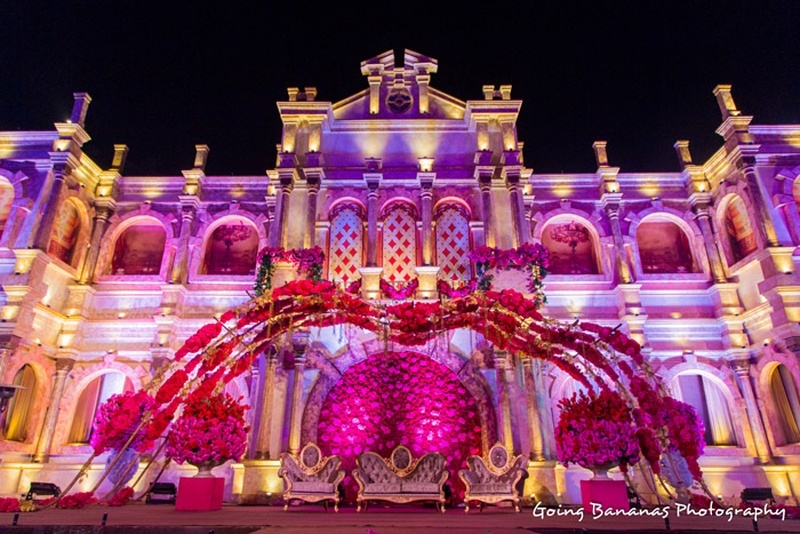 Known for its magical warmth Jagmandir, Udaipur also known as the Island palace proved to be the perfect venue for Hetali and Harsjeet, to host their grand destination wedding. It accommodated a large number of guests in its lush green lawns that seemed to spread endlessly. Whether it was at their uber colorful welcome party where we spotted some of the most quirky Indian clothes, the award-night styled Sangeet or the Royal wedding itself. The grandiosity that the venue exuded was enough to create a regal vibe that further spilled over on to the décor, the lighting as well as this gorgeous bride’s wedding attire, courtesy Sabyasachi. Given that Jagmandir is located in the middle of Lake Pichola, this island palace is accessible by a short boat or ferry ride from the City Palace Udaipur. It automatically allows for a grand guest and bridal entry. For a beautiful destination wedding that will take you back in time, and allow you to get married in the same grandeur as the Maharanas of Mewar. A wedding venue that doesn't need any introduction - The Leela Palace situated at the banks of Lake Pichola is an acknowledged brand in the country; it makes a perfect choice for a destination wedding or grand anniversary celebration. Who says age puts a limit to fun? Johnny and Elya definitely don’t agree. This couple recreated their wedding celebrations on their 25th anniversary celebration in a way that would put a lot of young couples to shame. Right from the vibrant mehendi, the festive sangeet and the open air wedding – the youthfulness and freshness of their love was evident in every detail of this extra special anniversary celebration. Each event held in different areas at this opulent venue had a distinct theme, with décor that left us captivated - The Leela Palace definitely gets two thumbs up from us! So if you not involved in planning the wedding of your dreams, think of a kickass anniversary celebration that will more than make up for the Shaadi. Fact - destination weddings and Goa are quite literally synonymous. Saloni and Akhil were in on this big secret and therefore decided to celebrate their vibrant union at Kenilworth Resort & Spa, Goa. A spectacular 5 star space sprawling over fourteen acres of land excellently hosted their colorful mehendi ceremony as well as their day-wedding under clear open skies. If you’re looking to do your wedding with a lots of tradition with a little sprinkling of kitsch, Kenilworth Resort and Spa is a venue, tailor made for you. Book this grand wedding venue at discounted rates here! Wouldn’t it be dreamy to tie the knot at a venue that overlooks the Aravalli hills?! Deeksha and Nikhil lived this dream in the luxurious space at Fairmont Hotel, Jaipur. Here is where their “happily-ever-after” began and must be say what a beginning it was! The lush central 'Charbagh' with its still water fountain where this gorgeous bride twirled and descended the majestic staircase outside The Grand Ballroom reminded us of a certain Rhett Butler and Scarlet O Hara Film. As a bride-to-be you have a wealth of opulent spaces to choose from, for your romantic pre and post wedding shoots. Whether your style is trend-setting modern, show-stopping elegance or softly romantic, Fairmont is your best pick. Deeksha and Nikhil’s wedding proves our theory. Whether it was the sangeet or the grand wedding, each event was beautifully executed. A perfect blend of Moroccan and Egyptian style architecture with spaces both indoor and outdoor to host all your pre-wedding events and your wedding, we discovered why exactly Shishir and Aanchal decided to host their wedding at this grand wedding venue. The Corinthians Resort and Club, Pune not only provided them with beautiful lawns and banquet halls but every nook and cranny, crease and culvert of the resort is a perfect location for a pre or post-wedding photoshoot.